Corsair Trimarans are the world’s most popular and versatile trailer trimarans. With their rich 30 year history as a world leader in high quality multihull manufacturing, Corsair Marine has more than 2000 trimarans sailing in all parts of the world. From one design racing to family cruising; day trailer sailing to longer explorations of the arctic and tropics, our Corsair Trimarans fleet will help you to achieve your sailing dreams at twice the pace. 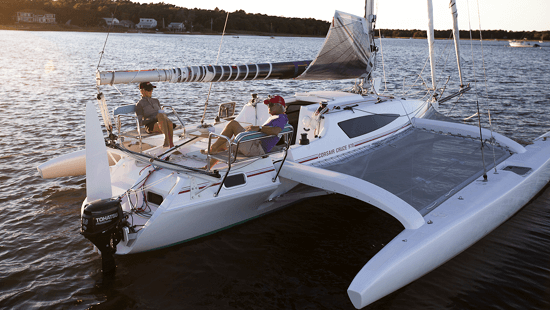 Extraordinary speed and effortless acceleration are trademarks of the Corsair Trimarans. Their ability to fly on a puff or generate their own high-power apparent wind is legendary. Without a lead keel to create drag and with tangible buoyancy in construction technique and materials, Corsairs are powered effortlessly by their high-performance sails. Superior safety is inherent in the design and construction of these boats and it stems from the same features that make them sail flat and fast. Corsair Trimarans can’t sink. In fact, with the hulls filled to the brim with water, the positive buoyancy of the materials of construction keep the vessel afloat even with all crew aboard. Comfortable stability at any speed and in almost all sea conditions is simply a feature of beam and buoyancy. Heeling is restricted to about 15 degrees, which feels like about 5 degrees on the broad, flat deck and trampolines of a Corsair. Accommodations are ample and designed for extended cruising aboard the larger models or streamlined for racing on all models. Berth areas are sufficient and comfortable, appliances are an option and a shower if you want one. You’re apt to lounge on deck or in the cockpit most of the time but when you do go below you’ll have all the comfort you need. Unparalleled construction. We do not compromise on materials or technique of construction. Corsair has pioneered high strength and lightweight construction technology that incorporates aerospace composite, foam sandwich construction, glass fabrics, carbon fiber, Kevlar unidirectional and vacuum bagging for an ideal glass to resin ratio. Low Maintenance. The combination of engineering and materials that make Corsair Trimarans so strong, sleek, fast and lightweight also make them incredibly easy to maintain. And, as Corsairs are seldom stored on the water, there is little need for everything from bottom coatings to anti-mildew sprays. Their ability to fly on a puff or generate their own high-power apparent wind is legendary. Without a lead keel to create drag and with tangible buoyancy in construction technique and materials, Corsairs are powered effortlessly by their high-performance sails. Beachability! On a Corsair, you can sail or motor up to the beach, step off and drop anchor on land, you can see if it is set properly! No need to load up the dinghy as everything is with you aboard and nearby. Trailerability is not a hassle. It’s an advantage! Especially since it only takes a single owner about 30 minutes to go from trailer to sailor and back again after a couple of practice runs. Corsairs fold up and pull out effortlessly, the mast comes down in moments, tows easily and smoothly and saves you a bundle on slip fees and seasonal storage.